The F-35 program has completed the final developmental test flight of the system development and demonstration (SDD) phase of the program. The final SDD flight occurred on 11 April 2018 at Naval Air Station Patuxent River in Maryland, when Navy test aircraft CF-2 completed a mission to collect loads data while carrying external 2,000-pound GBU-31 Joint Direct Attack Munitions (JDAM) and AIM-9X Sidewinder heat-seeking missiles. Vice Admiral Mat Winter, F-35 Program Executive Officer, said completion of the SDD phase is a milestone for the mammoth program. "Completing F-35 SDD flight test is the culmination of years of hard work and dedication from the joint government and industry team," said VADM Winter. "Since the first flight of AA-1 in 2006, the developmental flight test program has operated for more than 11 years mishap-free, conducting more than 9,200 sorties, accumulating over 17,000 flight hours, and executing more than 65,000 test points to verify the design, durability, software, sensors, weapons capability and performance for all three F-35 variants. "Congratulations to our F-35 Test Team and the broader F-35 Enterprise for delivering this new powerful and decisive capability to the warfighter." From flight sciences to mission systems testing, the work completed by F-35 test teams cleared the way for the Block 3F capability to be delivered to the operational warfighter. Australia was the first international partner to accept jets with Block 3F capability. More than a thousand SDD flight test engineers, maintainers, pilots and support personnel took the three variants of the F-35 to their full flight envelope to test aircraft performance and flying qualities. 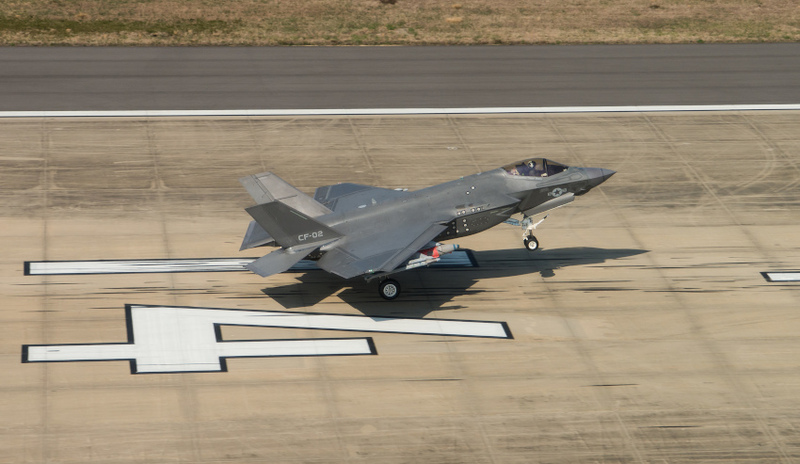 The test team conducted six at-sea detachments and performed more than 1,500 vertical landing tests on the F-35B variant. The developmental flight test team completed 183 weapon separation tests; 46 weapons delivery accuracy tests; 33 mission effectiveness tests, which included numerous multi-ship missions of up to eight F-35s against advanced threats. "The F-35 flight test program represents the most comprehensive, rigorous and the safest developmental flight test program in aviation history," said Greg Ulmer, Lockheed Martin vice president and general manager of the F-35 program. "The joint government and industry team demonstrated exceptional collaboration and expertise, and the results have given the men and women who fly the F-35 great confidence in its transformational capability." While SDD required flight test is now complete, F-35 flight testing continues in support of phased capability improvements and modernisation of the F-35 air system. This effort is part of the Joint Program Office’s Continuous Capability Development and Delivery (C2D2) framework, which Lockheed Martin says will provide timely, affordable incremental warfighting capability improvements to maintain joint air dominance against evolving threats to the US and its allies.